Multi-purpose fixture for studio, location or re­mote use. 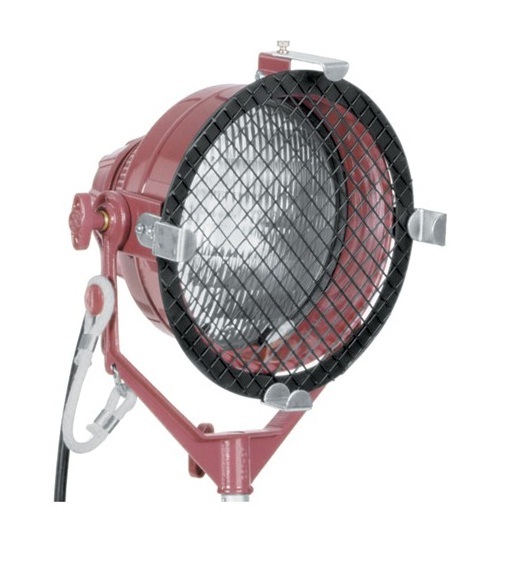 Lightweight and compact, it uses the highly efficient Quartz Par-64 fixed-focus globes, including the Quartz Par-64 Dichroic globes, for very narrow spot and medium flood. Diffuse and Specular Intensifiers are avail­able for boosting the light output. Excellent when used with intensifier for high speed pho­tog­ra­phy. Globe may be rotated for positioning oval shaped beam to horizontal or vertical. Separate Dichroic and Blue Molocolor Daylight Conversion Filters mount in diffuser clips. Equipped with safety screen. You can choose from the following Par 64 bulbs to use with the Molepar: WFL (Wide Flood), MFL (Medium Flood), NSP (Narrow Spot), or VNSP (Very Narrow Spot).